Welcome to the Mid-Week Menu, our weekly roundup of East Bay food news. 1) Inside Scoop has the latest on James Syhabout’s new project in the just-shuttered Somerset space (5912 College Ave.). The restaurant will be called Box and Bells, and some menu ideas that Syhabout and chef Daniel Coe are bandying about include such curiosity-piquers as potato boxty (a kind of pancake, apparently) with salt cod and herbs, fried chicken with raw oyster mayonnaise (raw oyster whaaat?? ), and cote du boef with a fricassee of snails. According to Inside Scoop, there will be a series of preview dinners at Syhabout’s other spin-off, Hawker Fare, probably starting in January. 2) The culinary transformation of Jack London Square continues: Eater reports that Miss Pearl’s Restaurant and Lounge (1 Broadway) has been purchased by a team of investors headed by Chop Bar’s Chris Pastena and Tom Henderson (who is also partnering with Pastena on Tribune Tavern). They’ll take over the waterfront space in January, do a quick remodel, and reopen on February 7 as Lungomare — an Italian restaurant. Pastena told me the inspiration for the menu will be Cinque Terre, a coastal area in Northern Italy whose cuisine has a blend of Ligurian and Tuscan influences, and a mix of seafood and meat. In the meantime, Pastena said a chef has already been hired, but that s/he needs to give notice at his/her current place of employment before an official announcement can be made. Stay tuned. 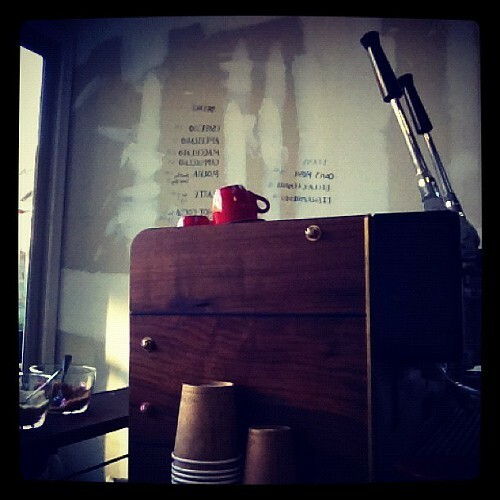 Sleek setup at Cro Cafe (photo courtesy of the cafe's website). 3) Also from Eater: The CRO Cafe has opened in Temescal Alley (near 49th and Telegraph). CRO was last seen doing weekend espresso service from a cart in front of Bartavelle, during the first few weeks of that restaurant’s build-out. The new alleyway kiosk will be open Friday to Monday, from 8 a.m. to 5 p.m., with a super-streamlined menu: No food per se, just Sightglass drip coffee and espresso drinks. 4) A Chowhound post tipped me off to the fact that Spoon Korean Bistro (933 Ashby Ave.) is now open for dinner, with new hours from 8 a.m. to 8 p.m. daily. Co-owner Jessica Oh confirmed the extended hours and said the menu remains unchanged. But now you can grab a casual Korean meal prior to doing a grocery run Berkeley Bowl West right before closing time, when the lines are shortest. 5) For those of you who won’t be cooking this Thanksgiving, here are a couple of fancy takeout options: In Berkeley, Saul’s Deli (1475 Shattuck Ave.) is offering a BN Ranch heritage turkey dinner (these are the turkeys Bill Niman is raising in Bolinas) with all the trimmings for $17.75 a person. Whole turkeys and side dishes are also available a la carte. Meanwhile, in Livermore, Wente Vineyards (5050 Arroyo Rd.) is doing a complete family-style takeout dinner (with turkey and salmon options, priced at $249 and $239 respectively) that serves six people. 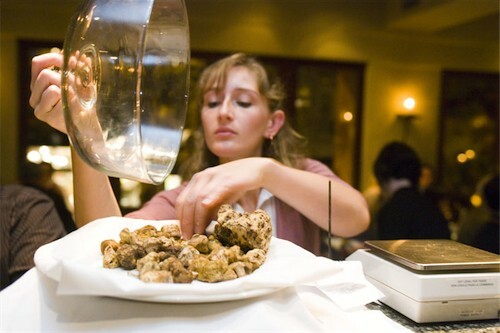 6) Oliveto’s annual truffle dinners are coming up next week, from Tuesday, November 13 to Friday, November 16. When I spoke to Oliveto owner Bob Klein for this week’s story about Community Grains, he mentioned that he was off to Italy to procure this year’s batch of truffles — he might be on the hunt at this very moment. The menu for this year’s dinners is still forthcoming; here is last year’s menu. 7) Let’s take a moment to geek out over some sweet food gadgetry: Umamimart (the blog) takes a closer look at the soon-to-open Ramen Shop’s (5812 College Ave.) Richmen noodle-making machine, from a demo event the Ramen Shop owners held at the Umami Mart store (815 Broadway) in Old Oakland a few weeks ago. 8) Coming on the heels of the news about West Oakland’s new grocery store project, People’s Community Market, Foods Co (a subsidiary of the Kroger supermarket megachain) announced last week that it has broken ground on a new warehouse-style discount supermarket in East Oakland, at 10790 MacArthur Blvd. The Foods Co store in East Oakland will be huge — 80,000 square feet, about as big as a mid-sized Costco — and is slated to open next summer. 9) Finally, in case you missed this week’s stories on hot soup for the under-the-weather crowd and a local company's quest to reshape our image of whole grains, well, you know what to do. Got tips or suggestions? Email me at Luke (dot) Tsai (at) EastBayExpress (dot) com. Otherwise, keep in touch by following me on Twitter @theluketsai, or simply by posting a comment. I'll read ‘em all.